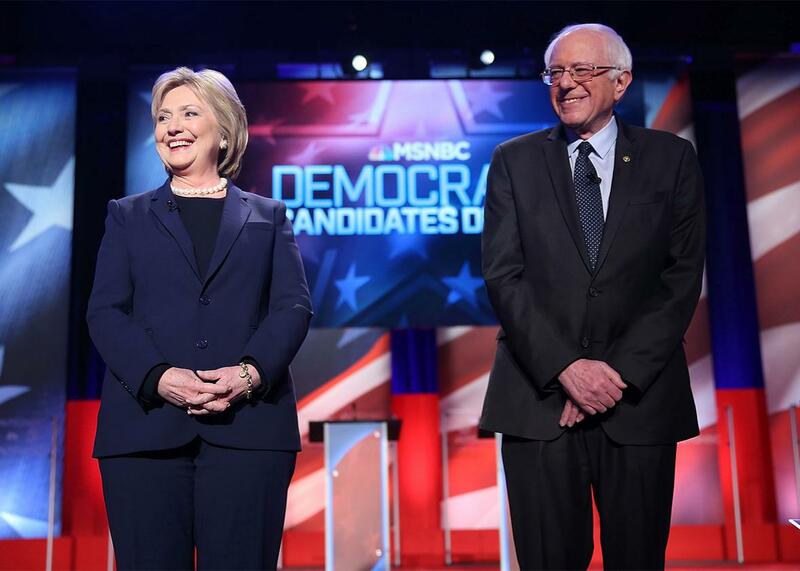 Bernie Sanders and Hillary Clinton’s MSNBC debate lines. With Martin O’Malley finally out of the Democratic primary, Hillary Clinton and Bernie Sanders have spent much of the last week worrying over language. Most of all, they’ve been arguing about the meaning of the word progressive, a term that each wants to claim—and that neither can agree on. Ultimately, those quibbles are probably just symptoms of their larger struggle, a fight that’s only gone more negative since the two candidates’ close finish in the Iowa caucus early this week. Will their long simmering tensions finally boil over during the debate Thursday night? Or will they stay focused on the issues that really matter? Either way, we’ll be following along throughout the evening, keeping a running tally of Clinton and Sanders’ best lines. I want to imagine a country where people’s wages reflect their hard work, where we have health care for everyone, and where every child gets to live up to his or her potential. I’m fighting for people who cannot wait for those changes, and I’m not making promises that I cannot keep. This is 2016. When we talk about public education, it can no longer be K through 12th grade. I am a progressive who gets things done. The root of that word, progressive, is progress. I’ve heard Senator Sanders’ comments. It’s really caused me to wonder who’s left in the progressive wing of the democratic party … But if we’re going to get into labels, I don’t think it was particularly progressive to vote against the Brady bill five times. The Republicans did win by three points. I came in second. In that race the Democrat was the spoiler, not me. I’ve got to just jump in here because, honestly, Senator Sanders is the only person who would characterize me, a woman running to be the first woman president, as exemplifying the establishment. Enough is enough. If you’ve got something to say, say it directly. You will not find that I ever changed a view or a vote because of any donation that I ever received. Let’s talk about climate change. Do you think there’s a reason why not one Republican has the guts to recognize that climate change is real, and we need to transform our energy system? Do you think it has anything to do with the Koch brothers and Exxon Mobil pouring huge amounts of money into the political system? That’s what goes on in America. Not one of the executives on Wall Street has been charged with anything … Kid gets caught with marijuana, that kid has a police record. A Wall Street executive destroys the economy … no criminal record. I have a broader view. If all we’re going to talk about is one part of our economy and one street in our economy, we’re missing the big oil companies. We’re missing other big energy companies. We’re missing the big picture. A vote in 2002 is not a plan to defeat ISIS. We have to look at the threats that we face right now, and we have to be prepared to take them on and defeat them. ISIS would like American combat troops on the ground so they can reach out to the Muslim world and say, Look, we’re taking on those terrible Americans. But combat on the ground must be done by Muslim troops with our support. Oh word. See, when you are old, then they go back all these years. I’m feeling the way I felt at the first debate. There’s a process underway. I will not politicalize it. By the way, there’s not a day goes by when I am not asked to attack her on that issue, and I have refrained from doing that, and I will continue to refrain from doing that. We never said, never said, that a newspaper endorsed us that did not. What we did say is, Blah blah blah blah was said by the newspaper. In a world of so much violence and killing I don’t believe the government should be part of the killing. So when somebody commits any of these terrible crimes that we have seen, you lock them up, and you toss away the key. They’re never going to get out, but I just don’t want to see government be part of killing. That’s all. Do I believe in trade? Of course I believe in trade, but the current trade agreements over the last 30 years were written by corporate America for corporate America. I want to have half-a-billion more solar panels deployed in the first four years. I want us to keep working on the Affordable Care Act to get not only to 100-percent coverage but to bring down the costs of prescription drugs. I want to move forward on paid family leave, on early childhood education. I want to do more for small businesses. I’m not getting ahead of myself. If I’m fortunate to be the nominee, the first person I call to talk to about where we go and how we get it done will be Senator Sanders. I happen to respect the secretary very much. I hope it’s mutual. On our worst days I think it is fair to say we are a hundred times better than any Republican candidate.